Creating a signature ultramarathon was one of the driving forces behind the 2014 founding of our non-profit running club, the Donner Party Mountain Runners (DPMR). The club provides the business structure, guidance, and community backing needed to produce such an ambitious event. My co-RD Peter Fain (Run on Dirt Coaching) brought a course that stitched together all of the locals’ favorite Truckee area trails into an seamless, if daunting, 100k horseshoe route. Meanwhile, we built an organization with a Board of Directors comprised of highly motivated trail runners. Castle Peak 100k sprang from these efforts. My race highlight this year was at the Johnson Canyon (mile 20) aid station, when I found myself in an ultramarathon group hug involving four DPMR board members. Betsy Nye coming into Johnson Canyon Aid Station. Photo Copyright Kane Cullimore. Betsy Nye came into the mile 20 aid station relaxed and smiling. 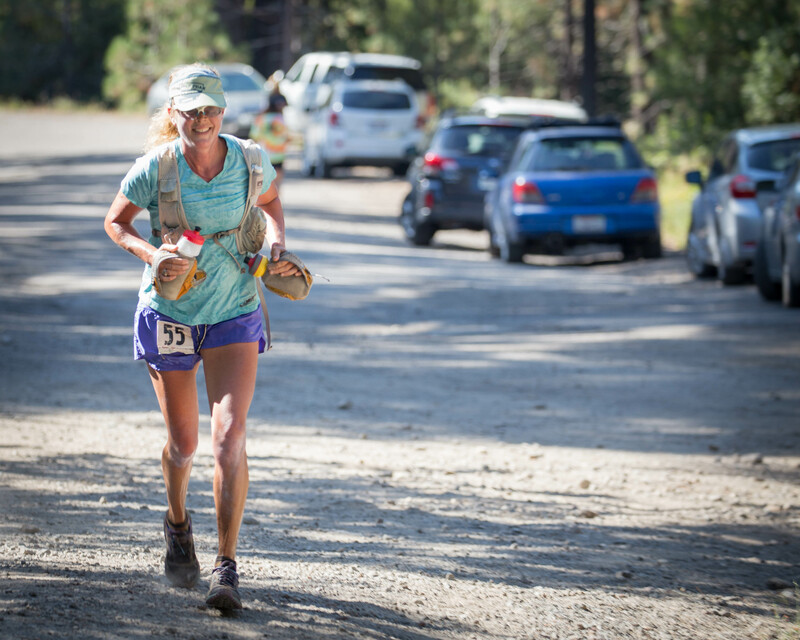 She is a local ultrarunning legend and a member of our DPMR Board of Directors. Betsy has been focused on family hiking and backpacking this year. 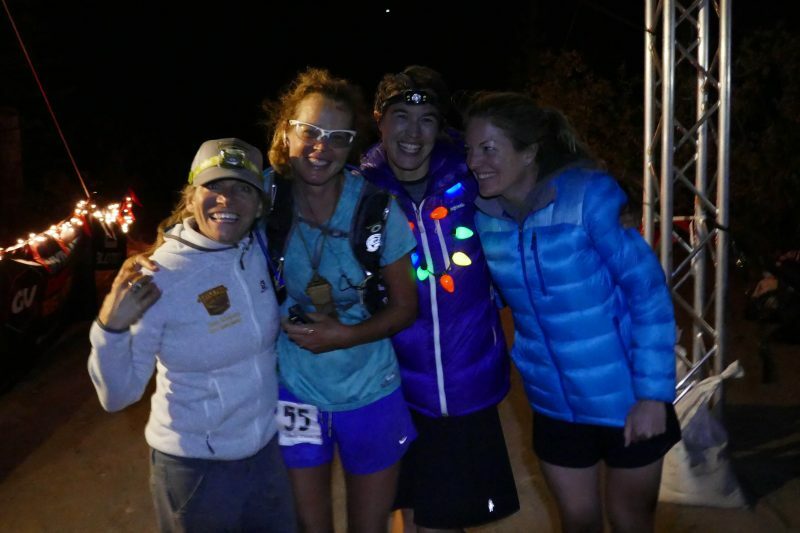 Despite this lack of specific training, she committed to finishing her third consecutive Castle Peak 100k. Lesley Dellamonica is more than just the Volunteer Coordinator for our race. She fills in any and every hole she finds, often involving tedious tasks such as rounding up loaner crock pots for the finish line. Jenelle Potvin’s absolute commitment to our member newsletter keeps the club relentlessly moving forward each month, in a fashion much like an ultra marathon. Jenelle also inspires us all with beautiful photos she snaps on her daily runs. We have all become close friends. And, so, when the three of us engulfed Betsy at mile 20 of the race, it was a special moment of our efforts coming to fruition. I looked around for a camera, but there was none. I will savor that fleeting moment in time as one of my favorites ever. We were missing our newest board members, Hillary MacLean (Sierra Symmetry) and Karen Kimble (who spent the entire day volunteering in the Palisades,) but I have no doubt that they will be part of future “defining memories.” Meanwhile, Directors Gretchen Brugman and Julia Millon were taking care of runners out at Devil’s Oven, where a crew of amazing women hiked supplies into the remote aid station on the other side of Basin Peak. By some luck of fate, all three of us were able to greet Betsy at the finish line. She looked almost as good there as she did at mile 20! This time I made sure we snapped a photo. Such a sweet post, Helen! So incredibly happy to have met up with you three at Johnson Canyon AND at the finish – what an awesome day.